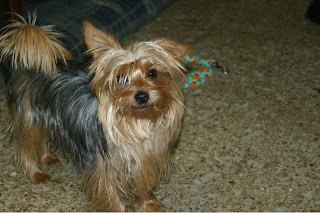 Yorkie Brothers with Tails: Helllloooooo Again. Hello again, We are soo very sorry that our nana has been so very busy. But she still manages to give us all the love and stuff we require to be healthy happy boys. It took her forever to get us all in the chair to take our picture but she did it with lots of coaxing with yummy treats. Nana had this put on a tshirt so she can show us off to anyone and everyone. 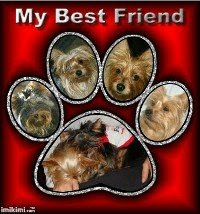 Oh and there is a rumor going around that sometime in the year 2010 there will be another Yorkie in the picture. See ya'' soon. 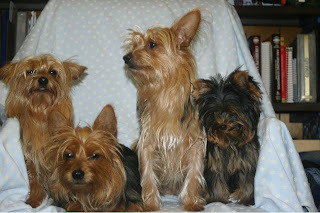 You have beautiful yorkies! 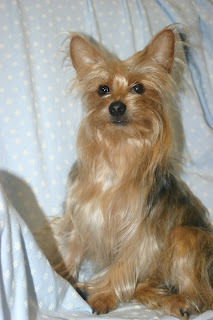 Show your pretty yorkie pups to the community.